My experiences, thoughts and views are getting a bit of an airing this week, as I can be found in other parts of the sewing community, rather than just my own regular corner. Firstly, I am this week's interviewee on the fabulous Love to Sew podcast. As you know, I'm a big fan of podcasts generally, and I've hugely enjoyed diving into this one since I came across it a few months ago. I actually listened to about five episodes virtually back to back one day recently whilst I was stuck in bed with a stomach bug! I've been soooo impressed with the quality of this crafty podcast. The presenters Helen and Caroline always get gold from their interviewees, and the episodes where it's just the two of them talking are always so well researched, thought provoking and inspiring. 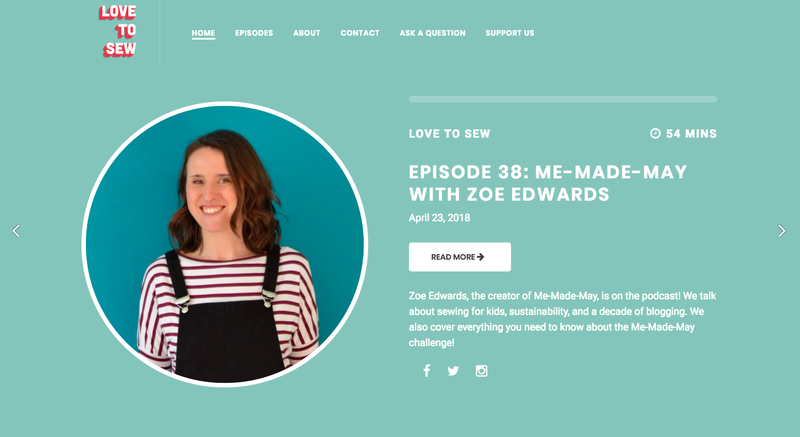 Anyways, they asked me to chat to them for an episode, specifically about Me-Made-May, this blog, sewing with and for kids, and sustainability. I must admit, I was super nervous about being recorded, but I'm really pleased with how the episode came out. I've been receiving some really lovely comments, mainly via Instagram, from people who listened and felt that some of what I talked about resonated deeply with them. If you're interested, you can take a listen here. 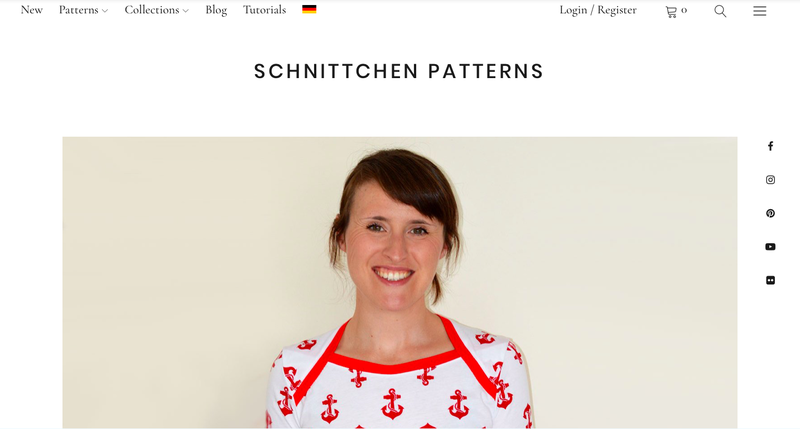 Second up, I was interviewed on the Schnittchen Patterns blog as part of a fantastic blog series they are producing as part of Fashion Revolution Week. You know all those pictures that pop up with people holding signs saying 'Who Made Your Clothes?' or 'I Made My Clothes'? That's thanks to the Fashion Revolution Week initiative. I was asked to be part of this series because I have written many times over the years about some of the ethical issues surrounding the fashion industry and home sewing. I'm pretty intersectional like that. Damn, they were some tricky questions Silke sent me! I did my best to answer them with the level of depth that they deserved. You can read the interview here. Do check out the other blog posts in the series as well. I've got a lot more to say about the ethics of fashion and sewing, and I have promised one particular reader that I'm going to revisit this topic very soon, probably after the dust has settled from #MMMay18. If you have any comments on, or responses to, anything I discussed on either the podcast episode or blog post interview, please pipe up. I'd love to keep these discussions going. Well, the sign-ups for this year's Me-Made-May (#MMMay18 for social media interactions) are coming in thick and fast. It's so fascinating and inspiring seeing how people have decided to challenge themselves for a whole month. I particularly enjoy reading the ones that include a little explanation of why they chose their specific pledge and/or what they are hoping to get out of the challenge. I intend to document my challenge photographically, although possibly not daily, as I've found that photos help me judge the success of my outfits. I will post weekly(ish) updates on my blog about how my challenge is going and what I'm learning along the way. I will include occasional updates on my Instagram account. I'd say that my current selection of clothing is about 90% to 95% me-made, so wearing me-mades and excluding my RTW won't be a challenge. However, pushing myself to create 31 different combinations within my me-made wardrobe is where things are going to be tricky. Like many (most?) people, I tend to reach for the same garments in the same combinations day after day. But I really want to make myself try out new combos to get the most out of my sewing efforts. Last year I has a massive clear out and donated a big chunk of my clothing to charity, as both my personal style and my body shape have changed a lot since having children (not to mention what my lifestyle requires from my wardrobe - bye bye cocktail dresses!). I've been populating my wardrobe with great pieces that fit my style, body shape AND lifestyle requirements, but I don't think each piece is being utilised as fully as it could. It's kind of an extension of how I feel about all my belongings in general, I don't want to own anything that doesn't see a decent amount of use/wear, at some point during the year at least. I think this pledge will help me achieve that within my wardrobe. On to the shout out. I've been having a big ol' think about how to celebrate Me-Made-May this year. During previous years' challenges we've hosted giveaways for participants to win clothes-making related goodies from a variety of wonderful and generous crafty businesses. However, it always seemed to me to be a real shame that only one lucky participant got to benefit from each giveaway. This year, I thought it would be nice to encourage crafty businesses to generate discount codes or offers for customers that are open to everyone as a more inclusive way to celebrate the challenge. Participants of Me-Made-May frequently find that taking part helps them discover holes in their self-stitched wardrobe. Therefore, we'd like these discounts/offers to run for the final week of May (24th to 31st), or at least part of that week (the weekend of 26th/27th May perhaps), to help this year's participants to buy what they need to fill some of those newly-uncovered holes. If any owner of a crafty online business would like to support and celebrate the MMMay community this year by generating some kind of offer or discount code, please email me the details (ideally by 14th May) to sozoblog (at) gmail dot com. I will publish a post with full details of any MMMay related discounts or offers during the third week of the challenge. Thanks in advance for your support!